Like most of you, we visit Christian websites on the Internet, some of them fairly frequently. Nearly always there is Scripture referenced in the text, often many references. However, when reading a page I almost never looked a reference up in my Bible. Often the Bible version you see is not the King James Version. There is a delay before the popup displays, especially if you have a slow connection. The links do not work offline at all. Organizations could redirect or discontinue the links at any time. They could be hacked and unwanted or obscene data could be sent in place of Bible text. You cannot enter a verse to view. When you click a link you are taken to another site and often subjected to unwanted ads, promotions, etc. Furthermore, most sites don't have their Bible references linked to any system. After doing some research we determined a Chrome Browser Extension was the best system to make a local, "stand-alone" reference tagger/viewer from. It also helps that Chrome is now the most popular browser, at around 65% market share. 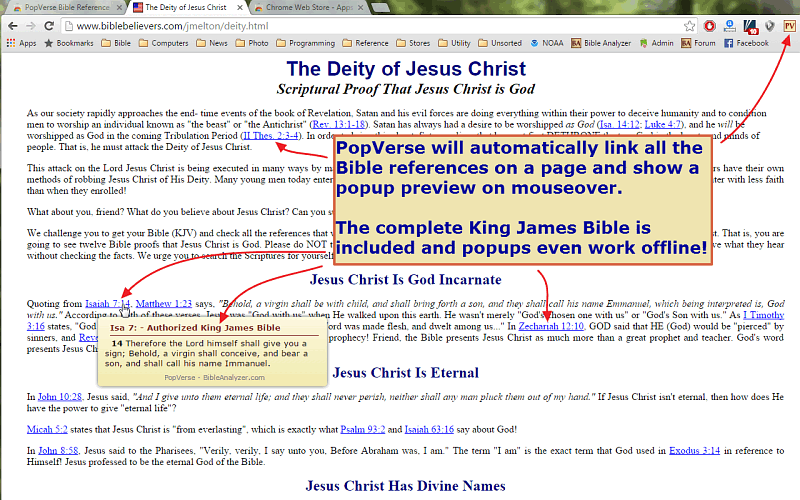 So learning the Chrome APIs and working in our spare time, the Lord allowed PopVerse for Chrome to be developed. There is no other reference tagging tool like it, and here's why. 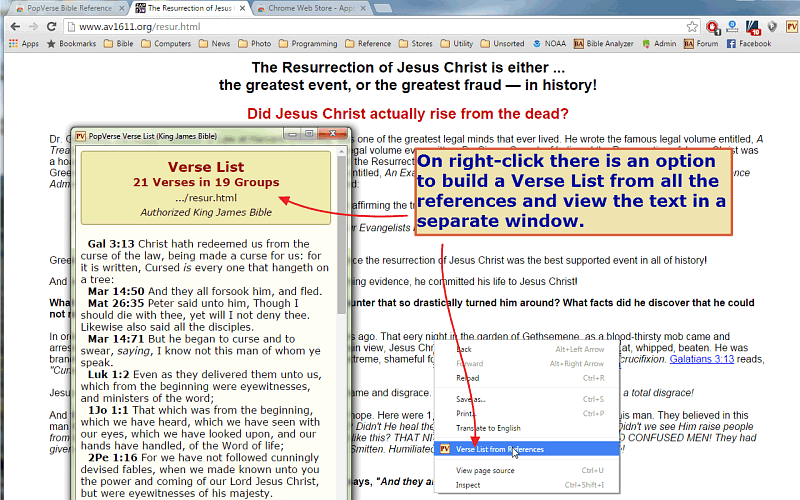 A Right-click will open a Verse List from References option where the text of all the Bible references on a page will be loaded in "Verse List Window." 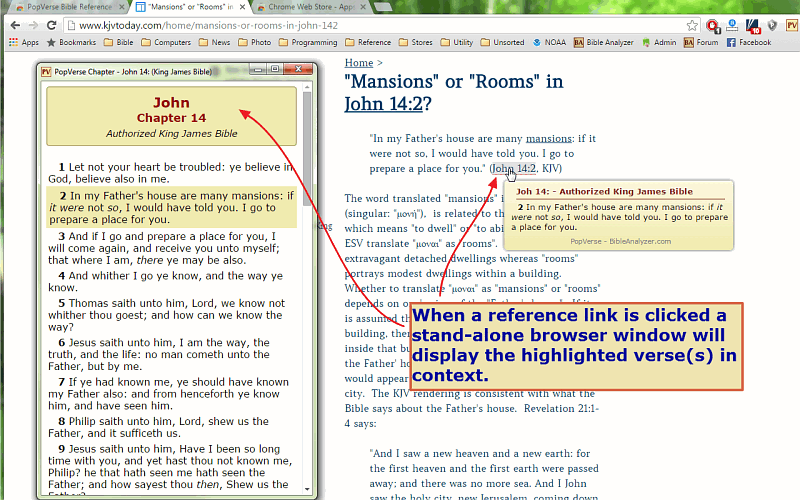 In the Chapter Window there is a button to turn on key cross references for each verse from the Treasury of Scripture Knowledge. Up to four cross references will be shown for each verse. Easily Enable/Disable PopVerse on any page. Change color scheme of popups and windows. Not susceptible to hacks or intrusions as data from remote servers is. The user is in full control and is never taken off the current page to a remote server which can include ads, nag messages, and other promotions. To Install PopVerse for Chrome all you need is the desktop edition of the Chrome web browser (or any of its derivatives, Brave, etc.) and then go to the PopVerse Page at the Chrome Store. Once there click Install and then visit your favorite websites with Bible references and see how it works. Furthermore, instead of having the Bible text placed in a server based database such as MySQL, we have put it in a file based SQLite database. The advantage here is a server database does not have to be setup and configured. Some small website authors may not have access to MySQL databases or may not wish to deal with them even if they do, so a simple file based database fits the bill for an easy "drop in" system. For PopVerse to work all that needs to be done is copy the few files that make up the PopVerse distribution into a single folder on one's server, and then put a script tag pointing to the popverse.js file in the HTML files one wants to link. After this, PopVerse should simply work. It will be retrieving the Bible text directly from the same server and domain the website is hosted from. SQLite is a very robust file based database system. (In fact it is the database used for our Bible Analyzer software modules.) It can handle many thousands of simultaneous connections thus there is no danger of database access lag even if many users are using PopVerse enabled web pages on a single site at once. popverse.js — This does all the heavy work and is loaded by each web page. chap.html — A skeleton HTML file of the chapter view window. popverse.css — A CSS file that the popup and chapter displays need. All together there is around 4 MB of data with the database being the largest file. If you have a web site and access to your server and want to give PopVerse a try, let me know. We will send you the package and simple instructions to install. PopVerse is still in a refinement stage but we are using it on all our pages here at PreservedWords.com and it seems to be working as expected.